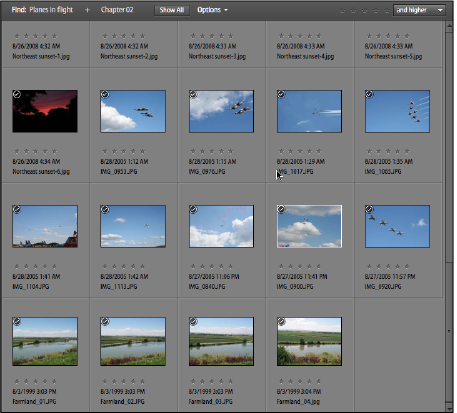 This tutorial provides you with a foundation for working with Adobe Photoshop Elements photo organization. It is the second lesson in the Adobe Photoshop Elements 10 Digital Classroom book. Photoshop Elements offers an intuitive way to label and catalog your pictures for quick and easy access when you need them. You will work with several files from the Lessons folder in this lesson. Make sure that you have downloaded the Lessons folder onto your hard-drive. In order to access these files, you need to import them. See “Adding files and folders to the Organizer” located in Lesson 1. Additionally, if you want Photoshop Elements to automatically detect when images are added to your library folder, you need to set it as a Watch Folder. See “Setting a Watch Folder” located in Lesson 1. To make selecting files a little easier, you can limit the display to only images used in each lesson. In the Keywords panel, select specific keyword(s) from the imported keywords submenu. 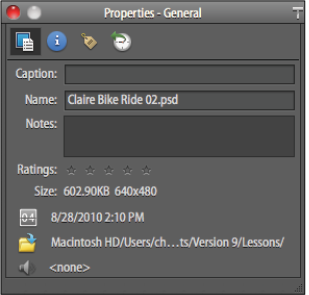 The Organizer is the heart of Adobe Photoshop Elements. You can use the Organizer to find, organize, and share your photos and media files. The Organizer’s Media Browser allows you to view thumbnails of any photo, video, or .pdf file that you have imported. To gain even more control over the images that you view, you can use the Timeline to view and sort by date, or the Keyword Tags panel to view photos by keyword, and the Albums panel to view photos categorically by event or subject based on albums that you’ve created. The Properties panel and the Options bar allow you to view pertinent information and make basic changes to your photos quickly and easily. The Elements Organizer is divided into several different areas. A. Media Browser. B. Options bar. C. Albums panel. D. Keyword Tags panel. The Media Browser is the main work area of the Organizer. Use the Media Browser to view and locate thumbnails of the photos, video clips, and audio files in your catalogs. You can select items in the Media Browser to attach tags to them, add them to projects, or edit them. The Media Browser is the hub for all work done in the Organizer. The Options bar provides efficient ways to view your photos in the Photo Browser. The Text Search box offers a way to search for photos by filename, keyword, caption and other criteria. The Rotate Left ( ) and Rotate Right ( ) icons allow you to rotate images into their proper orientation. The thumbnail slider controls the size of the image thumbnails that are being viewed. The View, Edit, and Organize in Full Screen button ( ) allows you to add keywords and make edits to your photos in full screen mode. The Media Browser Arrangement drop-down menu on the right side of the Options bar controls how photos are sorted by date, either newest first or oldest first. 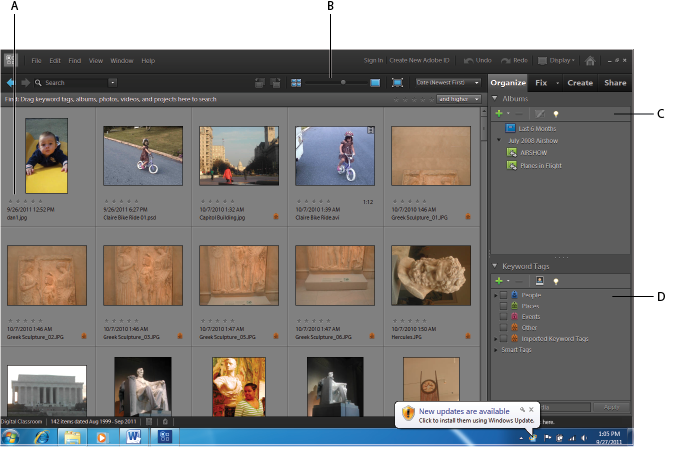 The Options bar allows you to easily organize and search for your images in the Photo Browser. 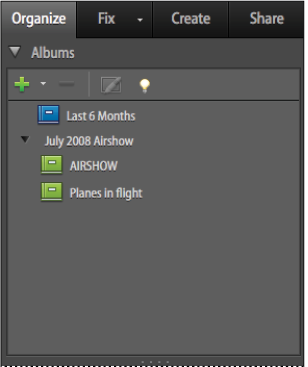 Photoshop Elements automatically organizes all your photos in the Media Browser Timeline, even if the photos are not tagged. The Timeline is divided into months and years, and you can view images from a particular month or year by clicking that month or year in the Timeline. Choose Window > Timeline to turn this feature on or off. The Timeline allows you to view the images in the Media Browser chronologically. The Properties panel, also located under the Window menu, is used to add and view additional information about your photos that is not available in the Photo Browser. Dimensions, captions, notes, file size, and location can all be viewed here. The Properties panel adds information to the image that can include details and descriptions. The Albums panel shows all the different photo albums that you have created to organize your photos. The default album shows all images that have been created in the last six months. Albums allow you to organize your photos in a variety of different ways. Think of the traditional photo albums that you may have created using photographic prints. You can create albums that group photos of a specific event together. For example, you might create an album to organize all the pictures you took at a friend’s wedding, at a child’s birthday party, or in a specific timeframe. As with traditional photo albums, Photoshop Elements albums are used to organize photos so that you can group similar subjects together. 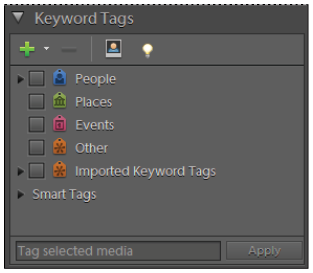 The Keyword Tags panel allows you to add keyword tags to your photos. Once applied to an image, keywords allow you to quickly sort through a wide range of images to display only what you wish to view. Keyword Tags are an organizational tool that makes finding images you are looking for much easier.